Egyptian Judges Prepare For A Strike After a series of controversial decrees by President Mohammed Morsi, Egypt's judges are now preparing to strike. One young judge talks about how he sees the crisis. "It's the biggest attack on the judges so far I've seen in my life. In the history of the Egyptian judiciary, I think it might be the biggest one or the second biggest one," says Auf, 35. The last assault on this scale, Auf says, was a series of decrees from former President Gamal Abdel Nasser in 1969 that removed the justice minister and purged many judges. The episode is remembered in Egypt as the massacre of the judges. Auf says Morsi's decrees are equally bad. "It's a severe violation for judicial independence, a severe violation for the rule of law, and a severe violation for all principles of the legal state," Auf says. The fresh-faced judge is a believer in the judicial system and takes his job in Giza's primary court seriously. It took him days to decide what to do when Morsi issued the decrees last week, after some courts decided to suspend their operations in protest. Auf went back and forth. Striking will hurt people's lives, he says, while not striking will shake the very roots of the judicial system. In a closed-door meeting at his district courthouse Monday, judges met for three hours to decide what to do. Crowds waited outside courtrooms for scheduled hearings, but the judges never came. They unanimously decided to strike, joining what Auf says are 80 percent of judges across Egypt. He was visibly exhausted from the deliberations. Auf adds that he was so moved to save the judicial system that he took the mic and encouraged the holdouts to strike. "It's not only for us, it's for the whole nation," he says he told them. "And we have to preserve, and we have to maintain the whole nation from this new tyranny trend, which is being born in Egypt now." He says that if all the judge strike, 20 million cases will be put on hold, from marriages to land disputes. The hope is that people will put pressure on the president to rescind his decrees. "This is our reaction. We are waiting for the second reaction from the president to change or to delete or cancel this declaration," Auf says. 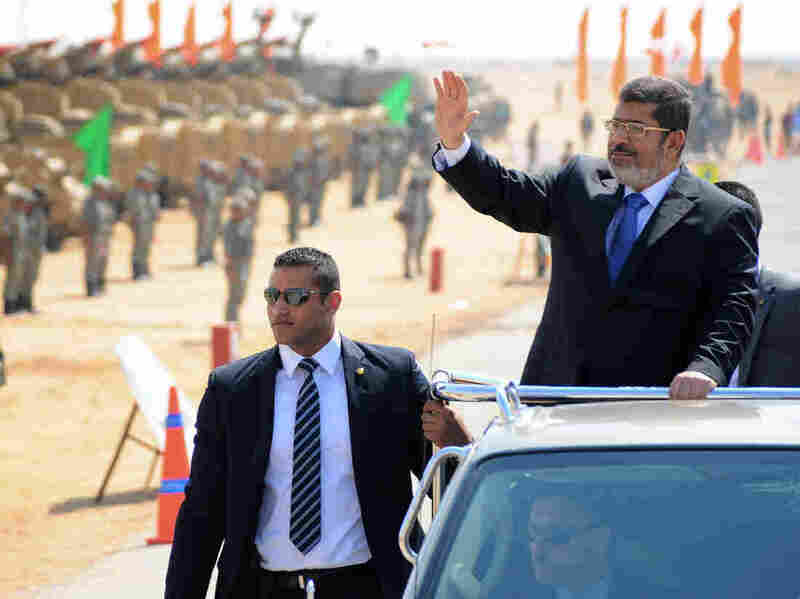 But Morsi's allies in the Muslim Brotherhood say the decrees are the only path to political stability. They charge that Egypt's top judges are remnants of the regime of Hosni Mubarak, the former president. In recent months, the Supreme Constitutional Court dissolved the elected legislature, then dissolved the first constitution-writing body — both dominated by Islamists. In another case scheduled for Dec. 2, it was widely expected that the court would again dissolve the latest body that has been given the task of writing the constitution. But attacking the judiciary, Auf says, is not the answer. "Is it logical to say if I couldn't have the decision that I want, that this court is corrupt, that this court is a remnant of the old regime? I have to accept the decision of the court regardless of whether or not it's for me or not," Auf says. He says he doesn't agree with the dissolution of either the Constituent Assembly or the lower house of parliament, based on his own legal interpretations. But Egyptians, he says, must respect the legal system or face the prospect of tyranny. "If you have any concerns about the judiciary, just change it by legitimate ways, by changing the laws, by amending the constitution, by the democratic means — not by this way," Auf says. Right now, Auf says he is worried that the nation will be ripped apart by the decrees. In some cases, demonstrations have been violent. "I'm asking God to save the country tomorrow," says Auf, "because we are all [feeling this] dangerous situation."